Now walk across the web photos of the new rover and Mars itself. That's right, because the landing device weighing nearly a ton on another planet - this is the greatest achievement of science and technology. However, do not forget about the past achievements. The same set of Soviet spacecraft sent into space and to other planets. As early as 1982, Soviet scientists sent spacecraft "Venus - 13" Venus.The launch was successful, and more importantly, the landing was successful, too.Even then, technology has reached the level where possible to transmit the signal from the surface of the planet. 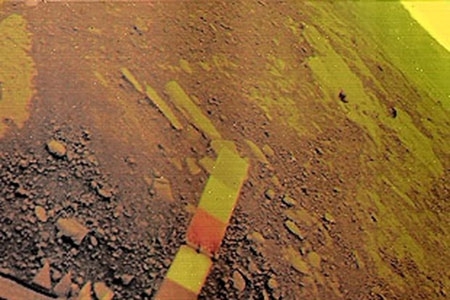 And "Venus 13" sent a few photos surface of "sister" of the Earth. This landing was much more difficult than on Mars, as on Venus is very difficult weather conditions. Several hundred degrees temperature, acid clouds, and things like that considerably complicate the work of devices on the planet.